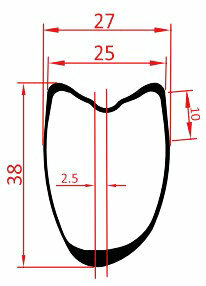 Item RT38D, weight 360g, ERD 569mm. These 25mm wide tubular rim 38mm deep is asymmetric shape, aerodynamic performance and it build up into stiffer, stronger and more reliable bike wheels by equalizing the spoke tensions between the drive and non-drive side spokes. These 25mm wide tubular rim 38mm deep is asymmetric profile, aerodynamic performance and it build up into stiffer, stronger and more reliable bike wheels by equalizing the spoke tensions between the drive and non-drive side spokes. Asymmetric 2.5mm offset rim profile to equilibrate the spoke tensions between the drive and non-drive side spokes. 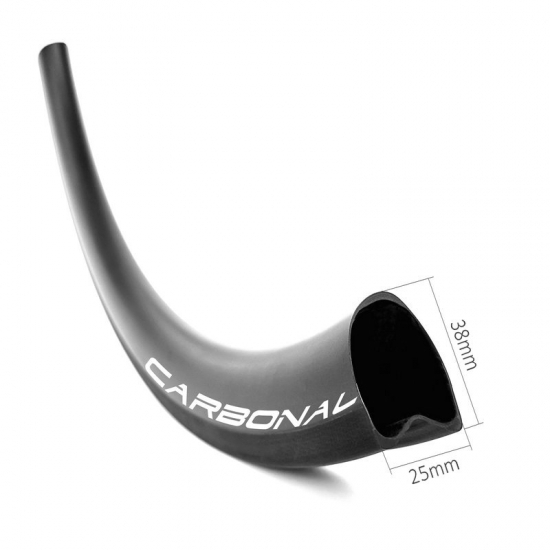 U aerodynamic shape makes road tubular rims lightweight but still stiff, keeping them stable in cross winds condition. High TG 210°C resin temperature brake track, less than 0.1% heating problem on these rim brake bicycle tubular wheels. Super lightweight, rim constructed with premium Toray T700 carbon fiber, best strength to weight ratio with no expense spared. 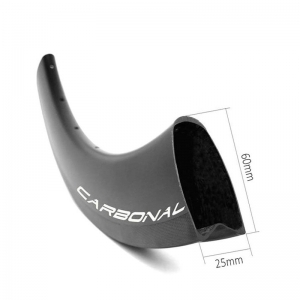 More about Carbonal carbon rim Quality Control. Item RT30S, weight 310g, ERD 586. 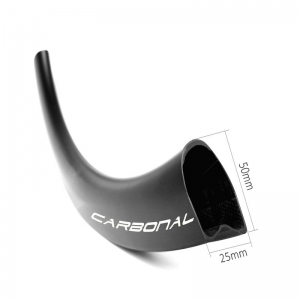 Wide and low profile makes these 30mm deep carbon bike tubular rims in super lightweight. 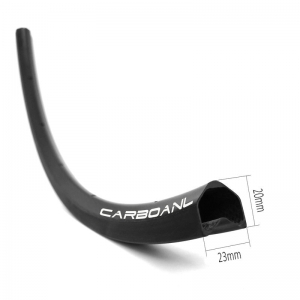 These 25mm wide 700c tubular rims work well with road bike tubular tires size from 25mm to 35mm wide. Item RT50S, weight 410g, ERD 545mm. 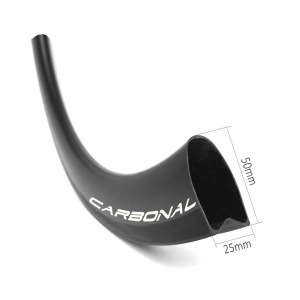 Carbon fiber 700c road bicycle 25mm wide 50mm depth tubular rim is aero, lightweight but still stiff. 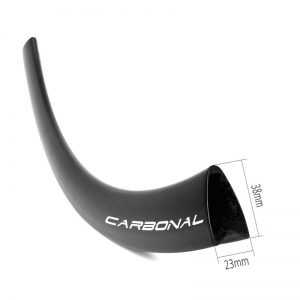 Aerodynamic and durable enough for flat road racing, training and also cyclocross riding. Item RT50D, weight 410g, ERD 545mm. 50mm depth U shape carbon rim is the most popular size, aerodynamic and asymmetric profile for more stable bicycle wheels by equalizing the spoke tensions between the drive and non-drive side. Item RT88S, weight 530g, ERD 469mm. 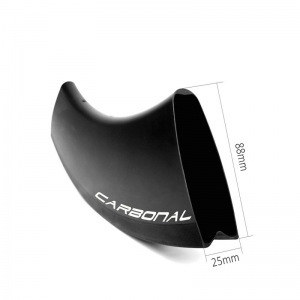 Carbon road rim with 25mm wide are more and more popular. The wider rim for road bike wheels increases air volume slightly, lower rolling resistance, better handling and more confidence. Item RT38W, weight: 330g, ERD 570. 700C road V shape 38mm tubular carbon rim is lightweight and aerodynamics, it's the best choice for light-weight road bicycle wheels. This 38mm tubular wheels rim can be for rim brake and disc brake.